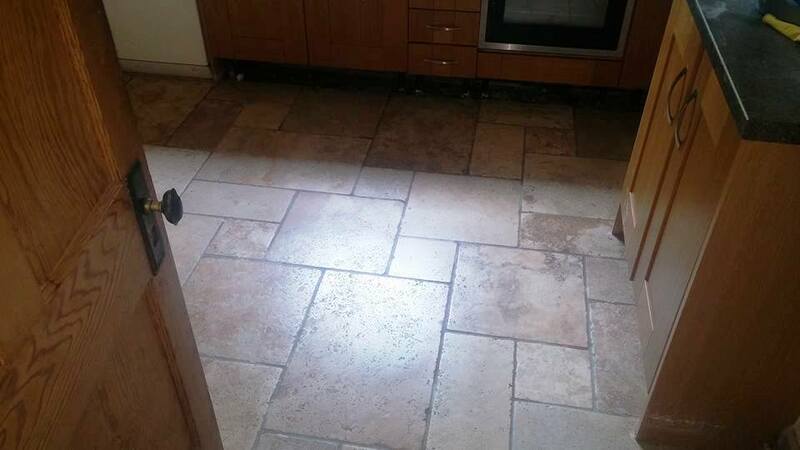 This Travertine kitchen floor in Exeter was mistakenly bought unfilled so there were deep holes on the surface of the stone that attracted grime and dirt in addition the floor had not been sealed to protect the stone and the whole floor was now in need of a deep clean and seal. The owners had installed the floor about five years before and were disappointed by the appearance from the onset. In fact, the floor had never lived up to their expectations and were close to ripping it up and starting again. Travertine is a lovely stone and really adds to the appearance of any room however being a form of Limestone and acid sensitive it naturally suffers from pitting corrosion which leads to the creation of small holes in the stone. These small holes rapidly become ingrained with dirt and this ruins the appearance of the floor. Typically, Travertine tiles will be bought with the pitted holes pre-filled with a resin to avoid this problem. After an initial visit to test the floor to identify the best products to use and a chat with the owners to talk through options, duration and processes involved a quote was produced along with standard T&Cs and the work was booked in to be completed shortly after. 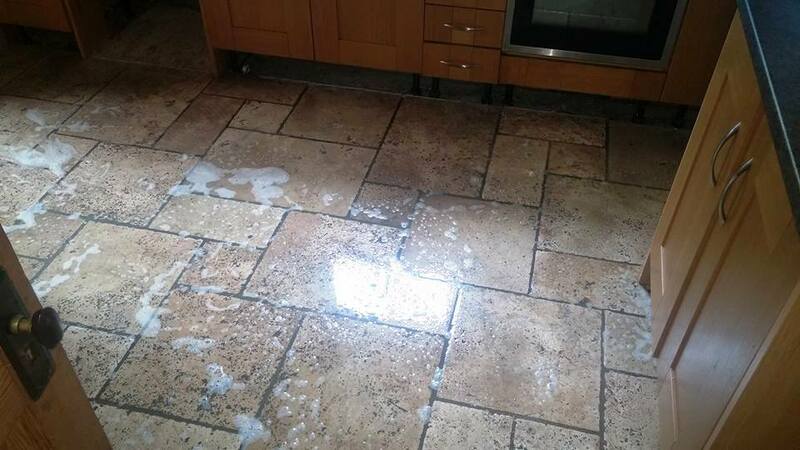 Burnishing is our tried and tested process for restoring polished stone such as Travertine, Limestone and Marble which has become stained and dirty. It involves the application of four diamond encrusted burnishing pads of varying grit levels from 100 to 1500. The first pad, which is Coarse, was applied to the stone together with a dilution of Tile Doctor Remove and Go, a strong stripper/degreaser to get into the pitting and lift the grime and completely strip away the top layer of dirt, exposing the clean layer underneath. The floor is rinsed with water and the soil extracted before the application of the Medium, Fine, and eventually the Very Fine pad to build up the polished appearance of the stone. As well as using the burnishing pad system, I also applied to the floor Tile Doctor Remove and Go, which removes any old sealer and penetrates the pitted holes to lift out and dissolve the ingrained dirt. At the end of the first day the floor was thoroughly rinsed to remove the dirt and chemicals from the now clean floor and the majority of the pitting was filled with a suitable filler. The floor was left to dry off overnight with the assistance of underfloor heating and then the following day a 3,000 grit extra fine diamond pad was used to clear off any remaining residue and give the tiles a slight shine before moving onto the next step of sealing the tiles. 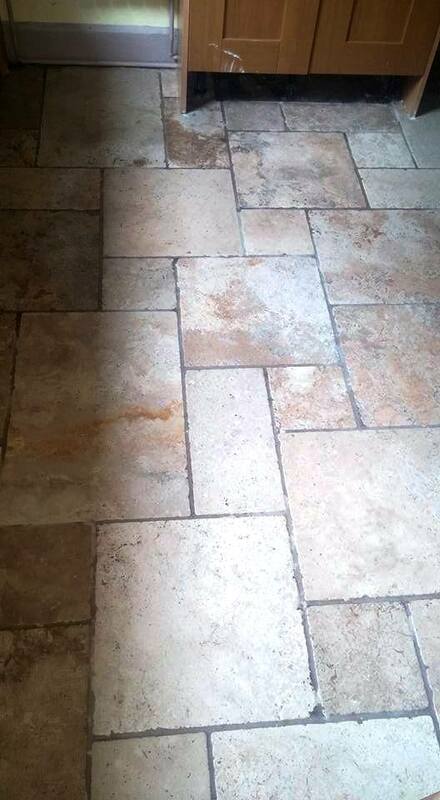 I sealed the floor using Tile Doctor Ultra-Seal, which is a natural look penetrating sealer that leaves a matt finish. The sealer will ensure the tiles are more resistant to staining and allow the floor to look as the customer originally wanted it to look for a lot longer. 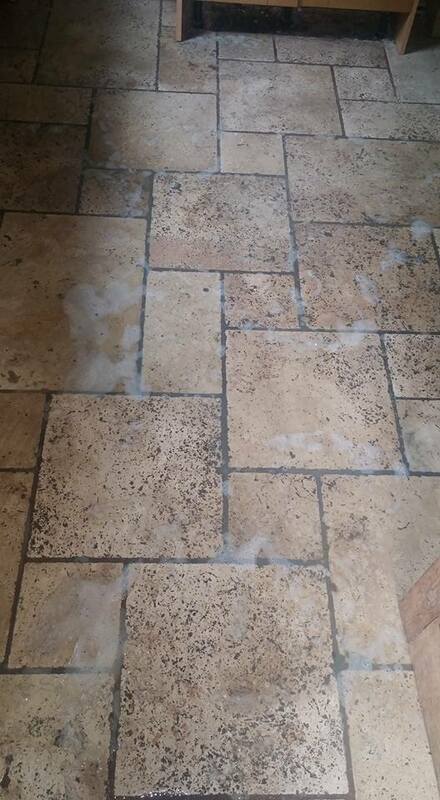 For after care I left the customer with a bottle of Tile Doctor Stone Soap which is a very easy to use, neutral pH cleaner for natural, sealed stone which not only cleans the tiles but continues to add to the natural patina so the more you use it the better the floor continues to look. This entry was posted in Work History and tagged Devon, Exeter, Filling, Floor, kitchen, restoration, travertine, Unfilled by AbzDominise. Bookmark the permalink.